A photo of Kim Yoo Jung and Lee Min Ho who were playing the role of young Yeon Woo and Prince Yang Myung in MBC Wednesday and Thursday drama series The Moon Embracing the Sun was released, and is very striking. In the photo, both of them was wearing ski suit, while Kim Yoo Jung was carrying Lee Min Ho on her back as piggyback. Both of them had an enjoyable time. 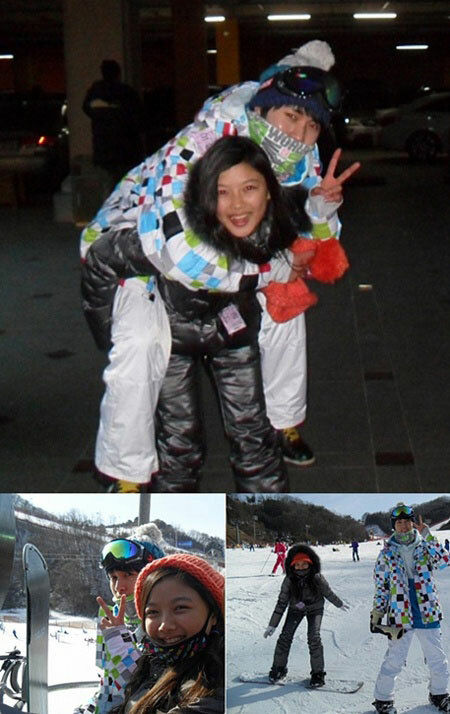 The photo together with several other photos were published by Kim Yoo Jung in her Cyworld mini-blog on February 15th, 2012 with the title of “Strong actress Kim.” The photos were taken in January 2012 when both of them together with another child actress Seo Shin Ae went on a ski trip. Three of them starred in Gumiho: Tale of the Fox’s Child drama in the summer of 2010. Netizens commented that they could not image that Kim Yoo Jung is so strong, comparable to strong man.